Theo Walcott's quick-fire hat-trick helped Arsenal to a 4-1 victory over Arsenal, ending a Premier League season full of its ups and downs at the Emirates in vehement fashion. It was the Arsenal side that had haunted the rest of the Premier League throughout various portions of the campaign, just one we didn't get enough helpings of if the Gunners would have challenged for the illustrious crown in the top flight of the English game. Despite losing steam as the weeks winded down, Arsenal—when at their best—had the hallmark of future title challengers. That would have been ludicrous to predict just back in December, when manager Arsenal Wenger was bombarded with boos from fans as he boarded a train following a 3-2 loss to Stoke City. "Wenger Out" calls were simmering once more, and the Gunners were teetering on a full-blown crisis. It was one of many sharp turns of events in the nine-month period of football. Alexis Sanchez needed little time to find his feet in North London, making big strides to repay his £35 million price tag from an early stage. Still, it remained a tale of leaving it late to get the job done, from Ramsey scoring a winner to sink Crystal Palace in stoppage time, to Olivier Giroud clawing back a point with a 90th minute equaliser at Goodison Park. Unlike other seasons, they didn't surge out of the blocks, but they upheld the infrastructure to open up the possibility to do so later on. Showing no trouble in dispatching the minnows, that's where the points really totted up and the side were at their best. They brushed aside Burnley, Aston Villa and others at ease, but when they were exposed, ideas were at times faltering. Neutralised by Chelsea, thwarted by Manchester United and stumbling to Swansea while dropping points at those who can find the flaws, the limits of their possession were clear. That would all be forgotten soon enough though with a run early in the new year that sent them flying—even if the concerns would rise later again. Arsenal showed their best in spurts, some small, like the team that was too much for Manchester City to handle, and the team that obliterated Aston Villa. Against the Citizens, they collated one of the finest performances of the whole season, with a Cazorla penalty and Giroud strike denting the title hopes of their opponents at the Etihad. They didn't only outscore the ruthless sky-blue clad counterparts, but they kept things together on a defensive standpoint too. The eventual turning point would take place just a short distance from home, as Harry Kane looked to stop that momentum giving Tottenham the victory over their local rivals in the North London Derby. 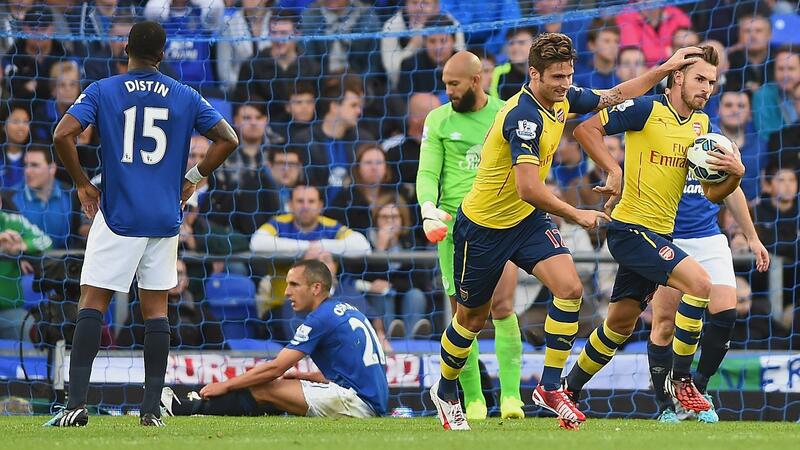 Eight straight wins propelled Arsenal to the possibility of doing the unthinkable. Including a bludgeoning of Liverpool at the Emirates, we saw exactly how fearful they can be when on a roll. Teams were picked apart at ease and players such as Mesut Ozil were returning to form. That momentum would take a wobble when they drew with Chelsea—but on the optimistic side of the spectrum, they made that feel like a victory to the Blues with their pressing, and persistently positive approach throughout the game. After once again installing plenty of class at the KC Stadium, the wheels wouldn't come off, but they would certainly slow down. Bafétimbi Gomis scored late to give Swansea a huge season-double over the Gunners, before they were forced on the backfoot for a majority of the first half at Old Trafford before Theo Walcott rescued a point. With nothing left to play for in terms of table progression, Sunderland certainly wanted it more when they took a point for their efforts at the Emirates days later. When Arsenal were in possession with space to run, they were rampant. But when that wasn't applicable is where the work needs to be done if Arsenal want to fabricate a title challenge next season. Olivier Giroud as the front-man in the side showed its frailties too, but with a third-placed finish and another trip to the FA Cup final, steps have been made, adversity has been overcome, now Arsenal need to make sure they translate this to the next campaign. Having a fixture in mind even when the dust settles in grounds across the country is a rare privilege that Arsenal are entitled to for the second straight season—especially given the tough ventures in the continent as Premier League clubs flopped in UEFA competition. That is another opportunity to put an exclamation mark on their progress. One step up in terms of league positions can be made even more powerful with a win at Wembley. Regardless of that result, Arsenal will want to be seen as title challengers in the future, and they have just over 70 days to sort that out. With players settling in, Arsene Wenger may look to replicate his doings last season and get the transfers done early—but maybe not flexing financial muscle as much this time round. Along with a striker potentially, stability is a necessity in football, and that's what is required in between the sticks. Wojciech Szczesny was fuming—literally—after being dropped for David Ospina when sources revealed he was smoking in the showers. While David Ospina has somewhat proved himself, it will be a thorough evaluation if Arsenal want to continue with the conundrum or silence it, especially with Petr Cech possibly available. Further dipping into the transfer gossip, Jackson Martinez has been linked with the Gunners too, not a bad induction at all, a risk worth taking with strong performances in Portugal. Next season, consistency is key. While we can't expect Arsenal to pick apart every team, winning more in the games that count, the so-called "six-pointers" in title race vocabulary will make the difference. From August to May, Arsenal were subject to some criticism and frustration, but they showed everyone they are capable. If they can do more of it next season, then call the title race on. Arsenal concluded a season of ups and downs in emphatic fashion, can they challenge for the Barclays Premier League 2015/16 title?